TGIF guys! Who's ready for the long weekend ahead? Yeah, I definitely am. I haven't done a thing all week so I'm really behind on just about everything. 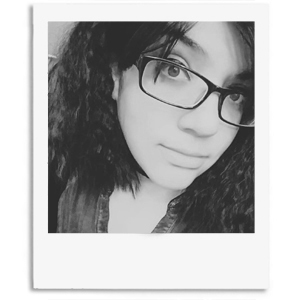 I think there is some revamping in order soon as I'm unhappy with a few things on my blog. But we'll talk about that some other time because my brain can't even handle anything else today. Except all those polish releases! This is a huge weekend for indies and I have been covering a lot of releases. 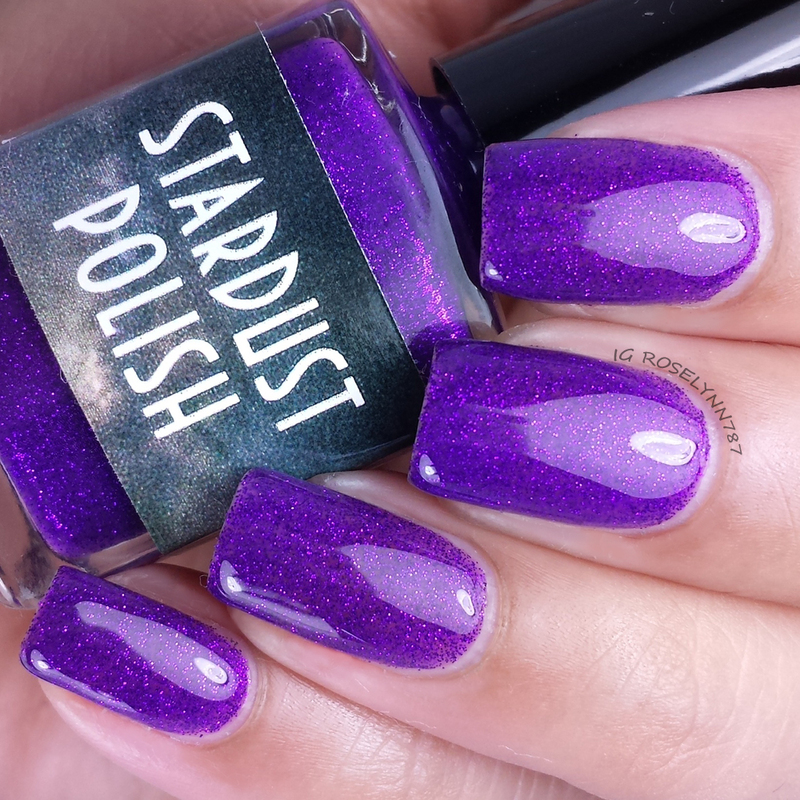 Today I'll be showing you three of the September 1st releases from Stardust Polish. As always, you guys are aware I'm one of the biggest fans of this indie since it was my very first one I purchased over a year ago. 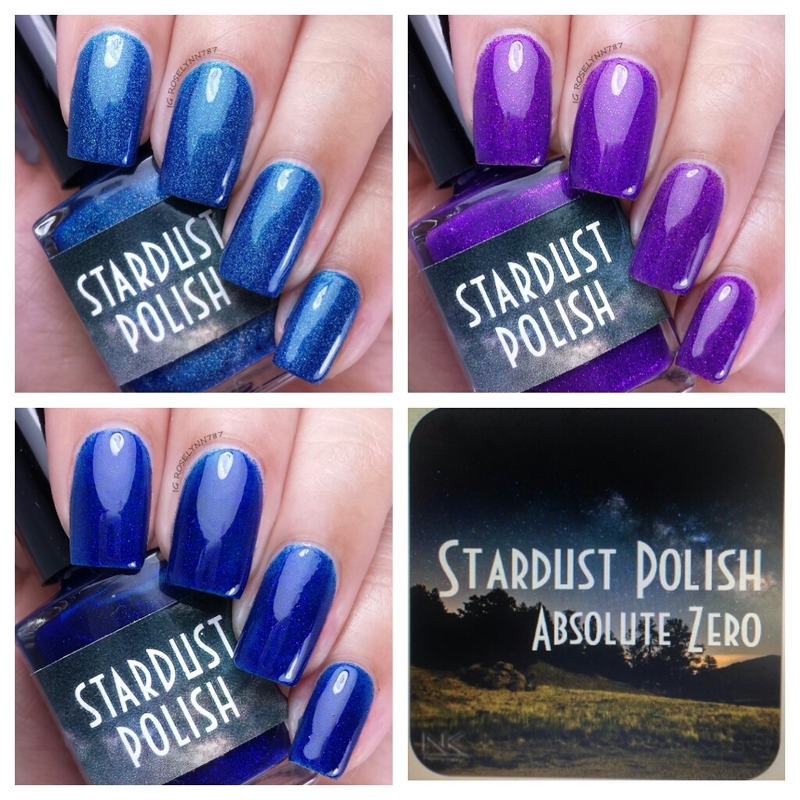 Not only am I showing you some swatches, but I'll also be showing you Absolute Zero. 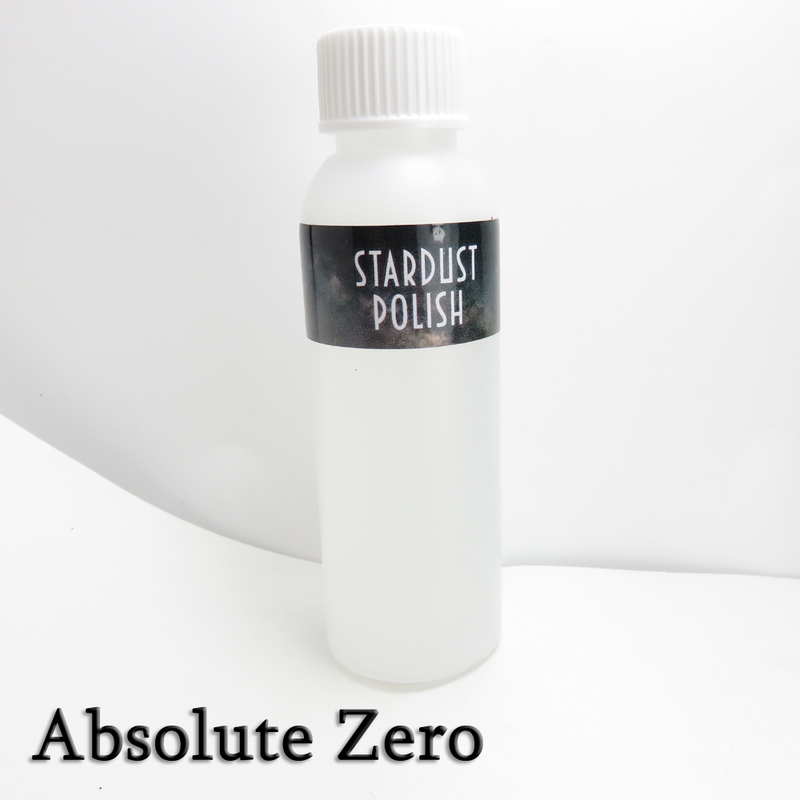 Absolute Zero by Stardust Polish is a gentle pure acetone nail polish remover. Definitely a fun filled post today ladies. 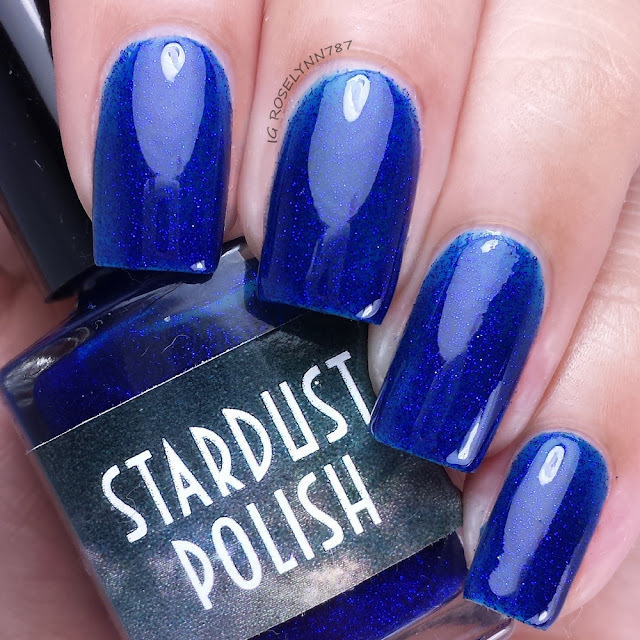 Everything that you guys will be seeing here from Stardust Polish will be releasing on September 1st at 5PM Eastern Time. 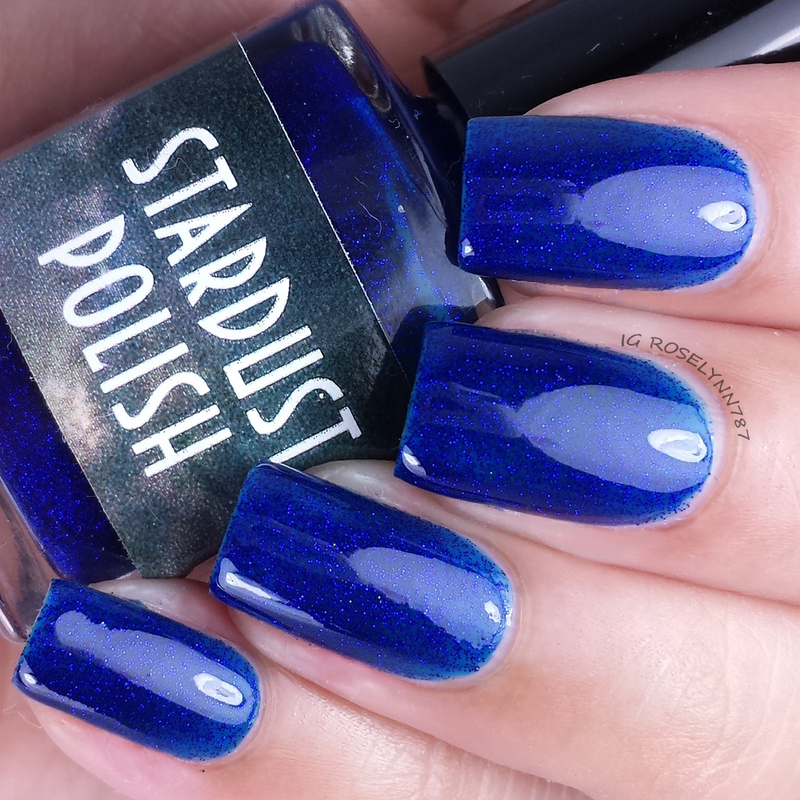 Giggle Water is a dark blue scattered holo. 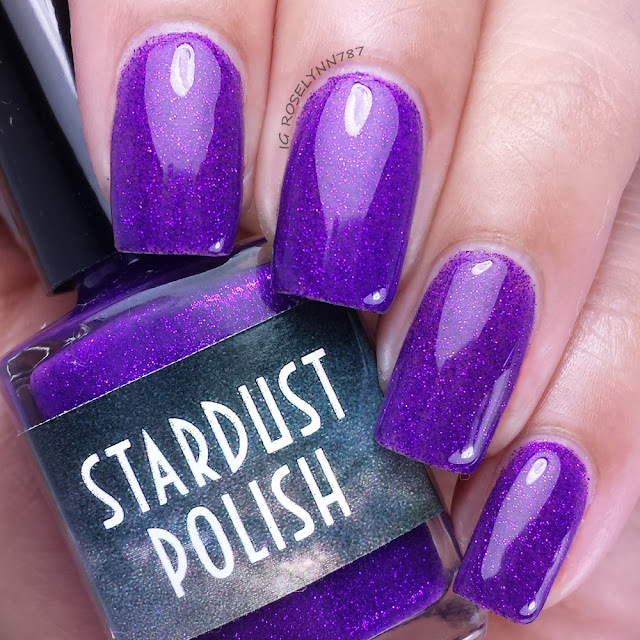 Drema, creator of Stardust Polish, is best known for her holo polishes and this beauty hits the mark. It's very captivating, with the shade and holo making it in fact give a water-like illusion. I happen to find this shade very flattering no matter the skin-tone, which you guys know is always a plus for me. Excellent formula, no issues and no staining. Sheer in one coat, I found that two thick coats gave me a perfect opaque finish. Seal off with a glossy topcoat and let this beauty shine on. Only 14 will be in-stock September 1st at 5PM and retails for $10.00, however, this is not a LE polish. A Cat's Meow is a royal purple jelly filled with microfine purple glitter. Absolutely love this shade of purple! So fierce. The color really fits into the Fall season as well for me. I decided to just layer this jelly as opposed to wearing it with an undie. If you do decide to wear an undie, I think this would look really eye-catching with a darker purple base. Again, excellent formula and application. Sheer in one coat, you'll need two-three coats for a fully opaque and finished look. Back Seat Bingo is a dark blue jelly filled with microfine navy blue glitter. 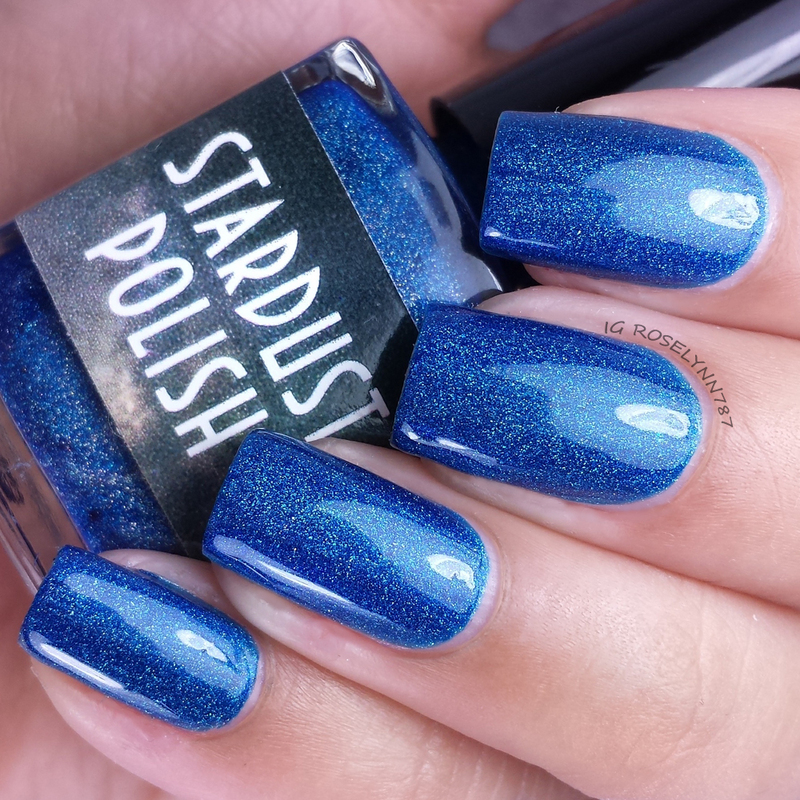 Another striking blue shade! Personally it's the season for the blue love to kick in. This is a great shade for the next two seasons. And it looks like such a cute squishy jelly. One thing you can always count on with Stardust Polishes is the formula, same great consistency and ease of application as the rest. This one is also sheer in one coat and will have a nice opaque finish with three thin coats. You'll definitely want to seal this with a topcoat to create even more of a squish squishy jelly look, haha. Now for the very interesting portion of today's post, Absolute Zero. 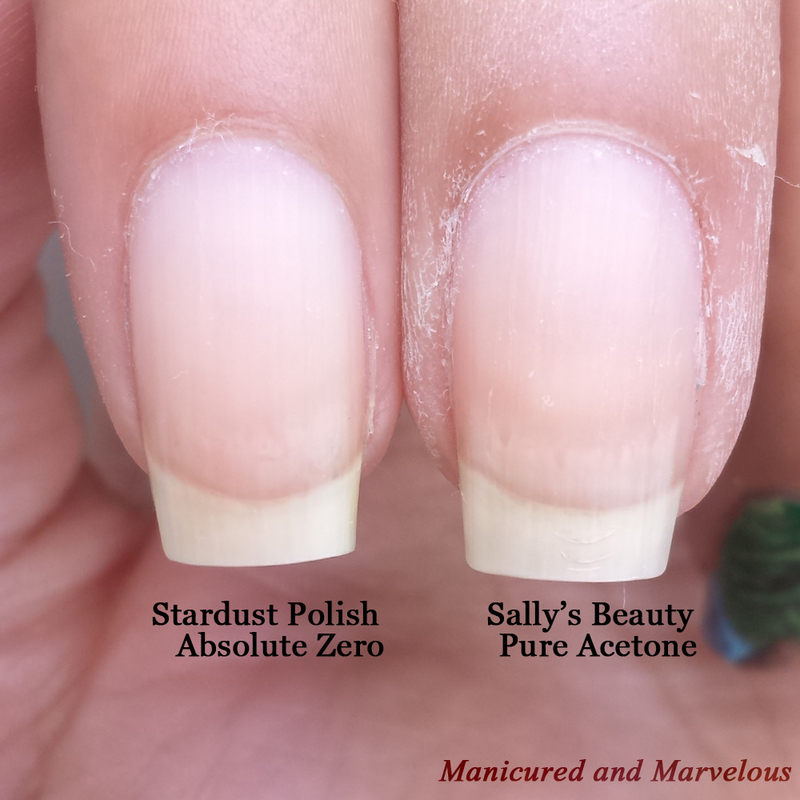 As I mentioned before, Absolute Zero is a polish remover made with pure acetone. It's as effective as using pure acetone but much more gentle on your nails and skin. This product is comparable in quality to Zoya, for those who might be familiar with their acetone. Below you can see how my nails and skin look after using Absolute Zero in comparison to my typical Sally's Beauty pure acetone remover. I have extremely sensitive skin and cuticles, however, Absolute Zero leaves my skin much more moisturized. It is just as effective at removing the toughest of the tough (glitter polish) in the same amount of time as it does to remove my polish with Sally's Beauty. With Sally's Beauty, you can see how dry and rough my skin becomes. For someone like me who takes acetone to my nails so frequently, you can see how damaging this can be. I actually start feeling 'burning' around my skin after two-three swatches when I use regular acetone. A few weeks ago, I had a swatch-a-thon and managed to get through seven swatches using Absolute Zero before my cuticles felt discomfort and needed a break for the night. Absolute Zero by Stardust Polish will come in different sizes and scenting options. For reviewing purposes, I received the regular scented kind. Keep in mind, the scenting portion is optional and will not completely mask the smell of acetone. You can see all the scenting (and pricing/sizing) options on the Stardust Polish website here, personally I'll be making a purchase to try out the peppermint. Absolute Zero will be available for purchase September 1st at 5PM EST. 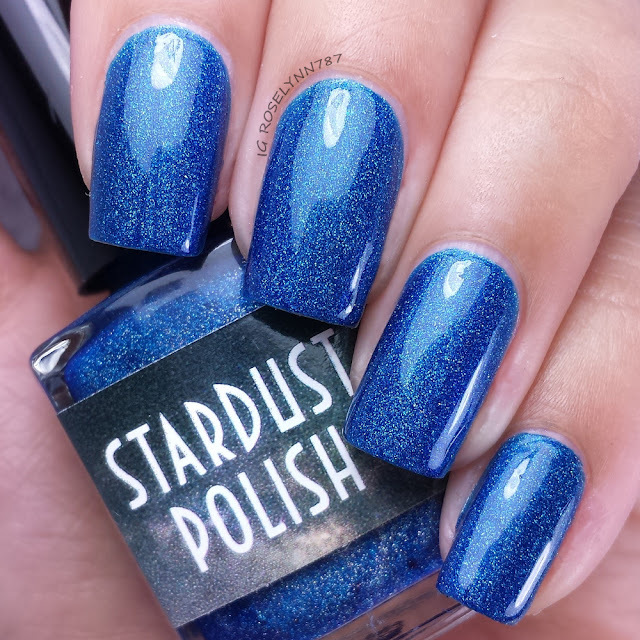 If you're not already, make sure you are following Stardust Polish for newest release, stock info, and sales. There are tons of polishes being released, a lot of which are Limited Edition and won't be restocked.